You might be surprised to know most Working Dog foods are the complete opposite of what a working dog really needs. An active dog needs quality meat proteins to build and retain muscle and overall health, and quality meat fats to burn as energy (they utilise animal fats much better than we do for energy). Most Working Dog foods are the complete opposite – low in quality meat proteins and meat fats. Instead they’re very high in carbohydrates (from cheap grains), the reason being it’s cheaper to produce, but also because manufacturers can use the excuse a working dog will burn off the carbohydrates before they turn to sugars and fat. 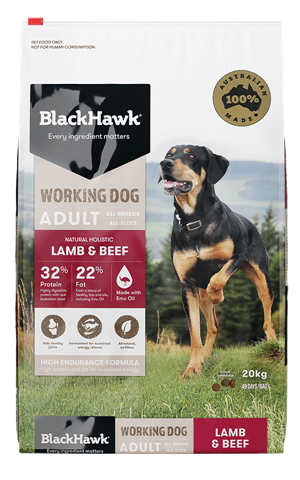 Black Hawk Working Dog, alternatively known as Pasture Grazed Lamb and Beef, is a high protein, high fat food. That sets it apart from most other working dog foods available in Australia. That’s a great thing, with the caveat being cost (but you get what you pay for). The first two ingredients are lamb and beef meat meals, both pre-dried protein dense sources of meat. These will amount to a significant proportion of the food as a whole. The third ingredient is oats, one of the better choices of grain and a good source of slow-burning energy. Rice (white rice) is also found as the fifth ingredient. There’s widespread belief that grains are bad for dogs when they’re not, the real issue being excesive grains, particularly wheat and sorghum. Oats and rice are good selections in this food in the quantities they’re in. Pea protein will play a part in the whopping 32% protein as well as adding fibre, as will peas which are also found in the food in a smaller amount. 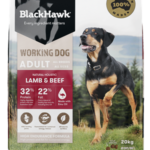 As a whole the food is well formulated and appropriate for a working dog. It’s nice to see the use of natural preservatives instead of chemicals, as well as a range of fruits, veggies, oils, and even eggs. This is a good food, and better than many other working dog foods.